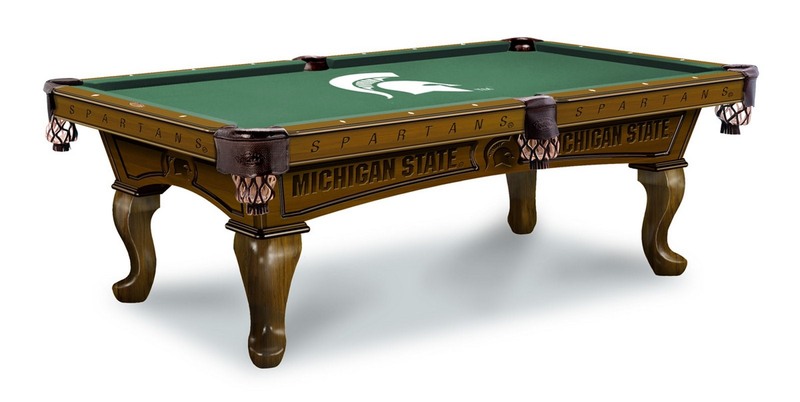 Michigan State University Pool Table 100% made in USA, manufactured by Holland Bar Stools. Michigan State University Pool Table will provide a permanent showpiece for your fellow Bills fans to drool over. It is covered in red, white and royal blue and features a great playing surface with exceptional wool billiard cloth made by Hainsworth. 8 ft. dimensions: 54" x 98" x 32"
Heavy Duty Center Beam Supports Carry the wieght of the 1" slate. The playing surface is made with 1" thick slate, guaranteeing a longer lasting, professional quality surface. American Heritage tables have hand rubbed finishes to give the table a beautiful finish. Ask about available custom options. Selection and Quality -Our goal is to offer the best product available to the consumer at the most reasonable price. We will not be undersold on any comparable product, or service. When you choose to buy a new pool table in Kansas State you can count on our team to deliver, set up, and bring your family years of fun and enjoyment. We offer high quality pool and billiard accessories in addition to our sleek line of American Heritage Billiards pool tables and game room collections of fine furniture. We also offer custom tables designed by Diamondback Billiards. We strive to cultivate lifetime customers that will tell their friends and family about the no pressure buying experience found at DB.